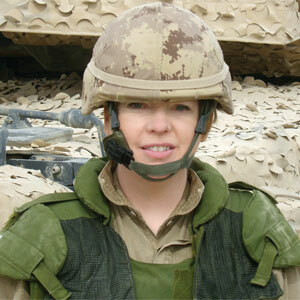 Sharon McKay in Afghanistan with the Canadian Forces Artist Program. Photo courtesy Sharon McKay. Young-adult novelist Sharon McKay has visited some rough parts of the world in search of material for her stories. When she was writing War Brothers, a book that follows five child soldiers through war-torn Uganda, she travelled to that country to interview kids on the ground. For an upcoming book about girls in Afghanistan, titled Stones Over Kandahar and due to be released this year, McKay again went straight to the source—but the experience turned out to be markedly different. She hitched a ride to Kandahar Airfield with the Canadian military in March of 2008, one of two artists— the other being Vancouver-based photographer Althea Thauberger—travelling there as part of the Canadian Forces Artist Program to stay with Canadian troops in Afghanistan for 10 days. But getting to interact with actual Afghan children proved more challenging than it had in Uganda. War artists’ programs have been around for more than 90 years, mostly focusing on visual representations of war. During the First World War, the Canadian War Memorials Fund commissioned a number of artists— mostly British—to paint evocative scenes that illustrated the horrors of war. Those works now hang on huge canvasses in the Senate chamber on Parliament Hill. Various programs have existed throughout the intervening decades, among them the Canadian War Records Program during the Second World War and the Civilian Artists Program from 1968 until 1995. Famed Group of Seven artists A.Y. Jackson and Frederick Varley participated during the First World War, as did renowned Maritimer Alex Colville, who captured the Juno Beach landing at Normandy in 1944. The current program was launched in 2001 with an expanded mandate: Instead of recruiting painters alone, the program’s website says it’s “open to all forms of art and all artists, from painters and sculptors to writers and poets.” Is the military simply looking for more creative ways to spread its message? Are artists being co-opted as propagandists? McKay thinks not. "Somalia 2, Without Conscience" by Gertrude Kearns. From the collection of the Canadian War Museum. “There was one war artist that I really admired,” she said, pointing to Gertrude Kearns’ famous depiction of a Canadian soldier, Master Cpl. Clayton Matchee, torturing a Somali teenager. That painting was funded by the War Artists program and hangs in the Canadian War Museum—over the objections of many veterans who found the painting offensive. In Kandahar, McKay chafed against the military’s restrictions. “I was born asking questions,” she says, “and you can’t ask questions. That’s hugely annoying.” She became frustrated by the blank stares she sometimes received when she revealed her occupation. Many troops just didn’t understand her interest in Afghanistan as a writer of young-adult fiction. Does the Forces’ artist program really bring the grim realities of war home to the Canadian public? McKay admitted it’s hard to do in only a few days. She wasn’t able to travel very deeply into Afghanistan, and was usually only a stone’s throw from Canadian soldiers. But she still met Afghan children and got a taste of the country that she otherwise couldn’t have seen first-hand. McKay says that while she thinks Canadian troops should get out of any combat role in Afghanistan, she came away impressed.